The thick grey clouds which loomed above Nairobi seemed to get blacker by the second, struggling to resist the pressure of the bulging mass of rain inside them. There was a huge gust of wind and then the clouds suddenly gave in, the heavens opened and within minutes the rain had submerged the city. The rainy season had finally started. For anyone who has experienced a torrential rain storm in East Africa, you will know what I am talking about. The power and volume with which the rain falls here is staggering, it bounces off the floor and the sound engulfs every other noise around. Everywhere descends into chaos and the roads become flooded within minutes – if you think the streets of Dar es Salaam, Mombasa and Nairobi are chaotic already, then you’re in for a shock. I’m not entirely sure what the American rock group Toto were on about when they said they bless the rains down in Africa, but I can assure you that when I was caught in a rain storm while driving home at night on the Waiyaki Way in central Nairobi, the words coming from my mouth certainly were not blessings. In fact driving on the streets of Nairobi at night in the rain has of late inadvertently become a new extreme sport for me! I’ve lived in Tanzania and Kenya for four years now and one of the main things I have missed about my home country England has been the dramatic seasonal changes – the stark difference between a late warm summers evening and a cold frosty or snowy morning and the change from summer to autumn, then to winter and the coming of spring. Saying I have now got used to the seasons here, which are predominantly rainy and dry. There are the long rains, from March to May, and then the short rains from October to December. In between those times it is usually hot, although on the higher grounds and here in Nairobi because it is almost 2,000 meters above sea-level the temperature in July and August can be quite cold. I remember on one morning when we lived in Mwanza, Tanzania, the sky looked a little over cast. When the husband, who had an early meeting, left the house at 6.45am, I nonchalantly said to him: “No you take the car darling, we’ll walk.” In the next fifteen minutes the clouds got darker and darker and by time I left with my three young children to walk to school at 7.15am the rain had already fallen so much that the roads had already become rivers and we were walking knee-deep in muddy water. But joking aside, I only curse the rains of Africa when I’m stuck in the middle of a storm. Of course, the rains are a blessing for the people of East Africa, many of whom face droughts due in an era where climate change is bringing less predictable rains. However, one of the ironies about the rainy season is that in spite of the high volume of rain falling, there are still water shortages. Many freshwater wetlands have become polluted or have been encroached on over recent years. Residents of Kenya’s capital are battling water shortages caused by drought and broken pipes. In addition to this water cartels tap illegally into the water mains and siphon off water, which is then sold to residents. As a result of this water is becoming contaminated and with contamination brings a much greater problem, cholera. Recently there were concerns that Nairobi’s main water source, the Ndakaini Dam which supplies about 85 percent of the 500 million litres of water the city uses each day, was not filling up despite the many parts of the country experiencing floods. But as of last week the water levels of the dam in Murang’a County have finally started to rise again, much to everyone’s relief. Another solution the Kenyan Government are working on is to rehabilitate a series of wetlands, dams and swamps both inside and outside the city, and pump the water to the capital. Here are some photographs I took while we were having dinner at Isamilo Lodge in Mwanza, where the weather couldn’t make up its mind and there were sunshine and showers at the same time. 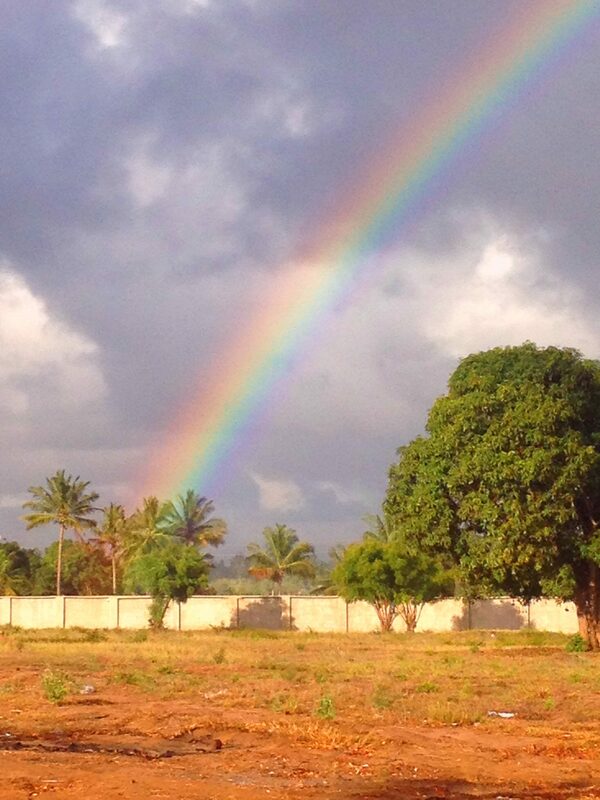 This was an amazing rainbow we were rewarded with after a storm in Kigamboni, Dar Es Salaam. When is the best time to visit East Africa? Probably the best wildlife viewing months in Kenya and Tanzania are during the dry season from late June to October. The wildebeest migration usually reaches the Masai Mara in Kenya in July and remains until October when they move back to the Serengeti in Tanzania. In Tanzania the time to see the wildebeest calving is late January to February. The climate on the coast of Kenya and Tanzania is similar to the inland weather, but hotter and more humid. January, February and July to October are the best times to travel as it is the dry season and predominantly hot and cool. November, December and April and June are the short and long rain months respectively. I really was humming the song the whole time I read this haha. But it always puzzled me when places that get so much rain struggle with water shortages! I am really glad we don’t have monsoon season here in Virginia haha. Oh boy!! This reminds me a bit of when I was caught on my bicycle in a downpour in Vietnam. I didn’t know so much water could fall from the sky. This Sunday, I am headed to Tanzania and we have been hearing that there has been a lot of precipitation… I’m not sure just how much of it my raincoat can handle!!! That photo of the steps with the water is rather concerning… I’m sure it will be wonderful regardless! Ah! I can hear and smell the rains! Plus the cacophony from the insects afterwards. Torrential rains look really scary! Andaman islands also face the same but I’m happy that as you mentioned in the post, govt is doing something about the waterbodies. Rains are a blessing, but they sure do make things hectic in the capital.